The Soft Cuddly Friends Baster dog is simply adorable, standing at 28 cm and made of plush material for your baby's soft skin. The bean bag at his rear, paws and soles make him a durable friend that you'll want to squeeze and hug everywhere. His eyes are stitched on. 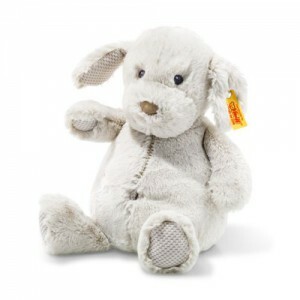 The web pattern in the ears, paws and soles invites you to give him a hug.